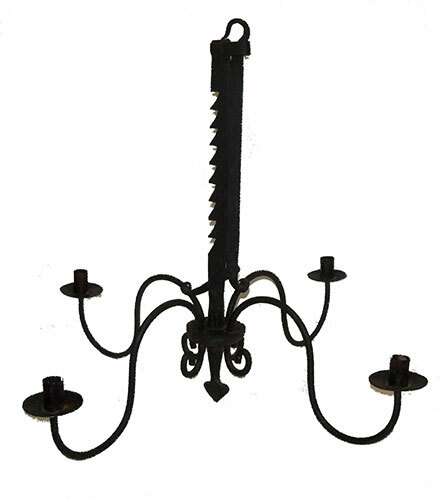 Presented here, a hand wrought Four Arm Iron Chandelier with a ratchet-type trammel that allows it to extend from 22 to 33 inches. It is 26 inches in diameter. While graceful, yet primitive, it was clearly made by a very skilled blacksmith even to including a HEART on the bottom of the ratchet. The condition is excellent. This is a very substantial piece, weighing around 20 pounds. While we sometimes see candle holders on trammels I have never seen a Chandelier! It s amazing and needless to say a very rare piece of early American lighting from a private Pennsylvania collection. I don t use the term Museum quality lightly but this piece certainly qualifies.